Welcome to Precision Martial Arts! Our mission is to not only teach amazing martial arts classes, but to provide a safe and fun environment for learning and growth. The goal of Precision Mixed Martial Arts is to empower as many people as possible so that they can be successful in anything they set out to accomplish. We aim to arm our students with the skills, confidence, and discipline needed to be able to defend themselves and achieve success in life. Whether you are looking for karate classes for your kids, self-defense classes for yourself, a safe place for your kids to go after school or on school breaks, or a really cool birthday party, we've got it right here! Master Adam Gilbart is a 5th Degree Black Belt and a Black Belt Schools International (BBSI) Certified Black Belt Instructor. He has been studying the martial arts for over 30 years and has been a martial arts instructor for over 20 years. Mr. Dave Farias (BJJ Instructor) has been training in Brazilian Jiu- Jitsu (BJJ) for nearly 20 years and has earn his Black Belt from Jay Page. He competes nationally as well as helped former and current UFC Vets hone their skills on the ground. He is part of the CAIO TERRA team. Mr. Joe Montoya (BJJ Instructor) has been teaching wresting and no GI Ju-jitsu for over 15 years and is certified in refereeing wresting. He has his black belt under Dave Farias (Jay Page) and is part of the CAIO TERRA team. 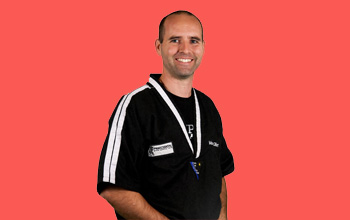 He brings a fun and realistic approach to our no Gi program. Miss Nikki Schachtel (Office Manager) is the go to person for all your martial arts needs. She handles all equipment purchases, new student memberships, summer camp/birthday party/after school program enrollments, and does it all with a smile on her face. Mr. Harris (Instructor) is a Black Belt who has been training in the martial arts for over 12 years. He is passionate about the martial arts and is great with kids.